The 3Lab Perfect Cream Anti-aging Exclusive Complex claims to contain a powerful antioxidant and also claims to firm and lift the skin, reduce the appearance of wrinkles and fine lines, and moisturize the skin. The official website states that you will have “visible improvements on the skin with continued use”. The “h” Serum claims to tone, lift, and firm your skin while preventing excess pigmentation associated with aging and sun exposure. This product uses human growth hormone, which may increase your skin’s healing abilities, reduce wrinkles, and increase your skin’s “glow and luminosity”. It claims to treat facial wrinkles by filling in fine lines with Promatryx and Hydranox complexes. It has been created with the highest quality of ingredients and the manufacturers claim to test all products three times to ensure that they can deliver what is promised. It promises to reduce the effects of aging while brightening the skin. The 3LAB products were developed by two chemists and a dermatologist in three different laboratories. The result is a skin care line that claims to treat facial wrinkles by filling in fine lines with Promatryx and Hydranox complexes. Skin brighteners have been included that will reduce an uneven skin tone and effectively diminish discoloration. The products also promise to put elasticity and collagen back into the user’s skin, leaving it looking more radiant. It’s a pretty tall order for any product to successfully complete, which may in part explain the high price tag on the entire anti-aging line. Every product by 3LAB claims to have been created with the highest quality of ingredients and the manufacturers claim to test all products three times to ensure that they can deliver what is promised. There are many specific anti-aging products in the 3LAB line to choose from, including the WW Cream that promises to reduce the effects of aging while brightening the skin. The Perfect Eye Cream boosts collagen to the sensitive area under the eyes, and the Perfect C Serum will pump up the collagen volume over the entire face. One of the newest additions to the line is the Perfect H Serum, which contains a “bio-engineered human growth hormone” for maximum anti-aging benefits. 3Lab has a pretty diverse selection of products and there are over a dozen specialty creams and toners to choose from. We will take a closer look at the three products mentioned above, since they seem to be the best out of the anti-aging products offered from this company. 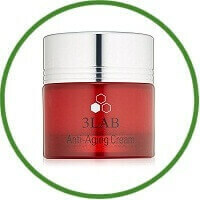 The 3Lab WW Cream is an “Anti-Wrinkle with Brightening Complex”. This product claims to not reduce wrinkles and to encourage your skin cells to reproduce faster, which may lead to fresher, younger looking skin. This product is more of wrinkle filler than a skin tightened so you probably won’t experience long term effects. 3LAB contains to be above and beyond the level of their average competitor. With a $400 price tag, they better be. But they fail to provide the evidence to back that claim up. At that price, a consumer could easily get botox injections, and the average consumer could most likely achieve the same results 3LAB actually provides at a fraction of the cost. There are several products out there that provide a fully proven ingredient list and a much more affordable price.